Reducing trade costs is essential for developing economies to effectively use trade as an engine of growth and sustainable development. As a result, trade facilitation and the digitalization of trade procedures have taken increasing importance as evidenced by the WTO Trade Facilitation Agreement (TFA), as well as the growing number of regional and subregional initiatives for facilitating the electronic exchange of information along international supply chains, including the ASEAN Single Window Agreement (ASWA) and the more recent Framework Agreement on Facilitation of Cross-border Paperless Trade in Asia and the Pacific (FA-CPT). • ASEAN implementation rate of the measures stands at 64.3%, well above the Asia-Pacific regional average (50.4%). 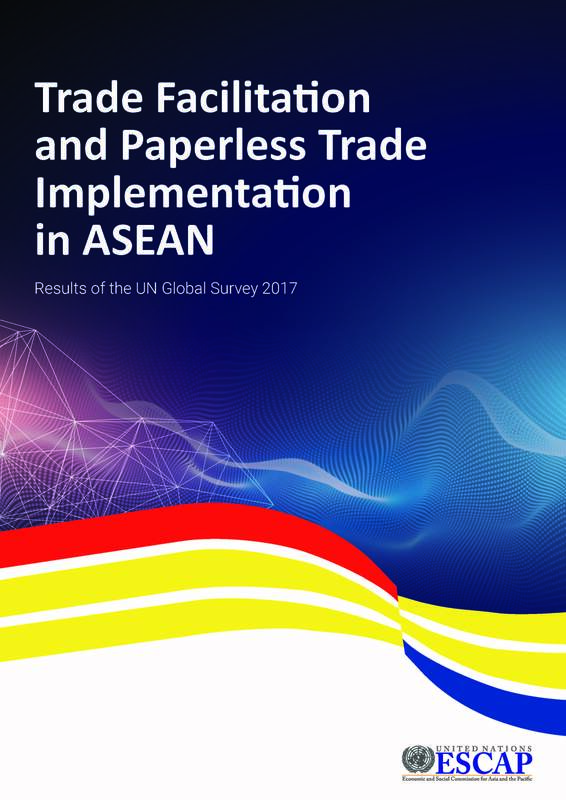 Apart from Australia and New Zealand, ASEAN’s implementation of trade facilitation and paperless trade is second only to that in East and Northeast Asia (73.7%). • ASEAN has made good progress. Implementation rate of ASEAN as a group improved from 59% to 64% between the first and second Global Surveys conducted in 2015 and 2017. Myanmar made the most rapid progress in advancing implementation: its implementation rate increases by 15% during that period. • Implementation in ASEAN remains quite heterogeneous. Malaysia, Singapore and Thailand achieve world-leading implementation rates of over 80%, while implementation in Myanmar stands at about 40%. Cambodia and Lao PDR lead all other Asia-Pacific Least Developed Countries, with implementation rates approaching 50%. • ASEAN countries have already implemented many of the WTO TFA related measures, in particular transparency measures. However, cross-border paperless trade implementation remains low despite ASEAN having taken an early global lead in this area through the ASWA in 2005. • Implementation of “inclusive” trade facilitation measures to promote SME and women participation in trade remains low and ASEAN may further promote such measures in the context of the 2030 Sustainable Development Agenda. The report also includes an analysis of the impact on trade cost of increasing implementation rates in ASEAN. Achieving basic ASEAN-wide compliance with the WTO TFA may reduce trade costs of the group by about 5-6%, while a more ambitious strategy involving digital trade facilitation and cross-border paperless trade could reduce trade costs by approximately 20%. Going forward, the ASEAN members may further accelerate implementation of the ASWA and related measures. To do so, all ASEAN members are encouraged to actively participate in the FA-CPT, the new UN treaty dedicated to advancing regional cross-border paperless trade through pilot projects, information sharing and coordinated adoption of international standards and implementation models.